TIG is probably one of the most difficult types of welding there is. It requires a high degree of dexterity. The finished weld needs to be clean and structurally sound. And in many cases welds must meet strict code and standards requirements. Your equipment is only one part of the equation, but quality matters. After all, it's where the rubber meets the road. In this post we'll highlight the top rated TIG welders in three popular power categories. Top Pick Overall. Great power, intuitive controls, and lots of flexibility. Easily outperforms machines 2x it's price. More power than the 210. Same simple controls, works VERY well on thinner materials requiring a delicate balance. While price is ALWAYS a consideration, it’s important to look at all sides of the equation when investing in an expensive tool. A budget machine might be great if you’re a hobbyist looking to supplement a MIG machine, but it won’t have the flexibility and power needed for larger applications. We'll start by reviewing the best TIG (tungsten inert gas), also known as GTAW (gas tungsten arc welding), welding units under 200 Amps. For the money, these machines are tough to beat. They're great for beginners, offer both AC & DC capabilities, and some can even handle aluminum. They're perfect for anyone just dipping their toes into TIG welding or if you will only be working with smaller gauge materials. The Forney 322 offers the best balance of quality, capability, and price of any of the models we tested in this power category. It's a multi-process welder so it can handle Stick, TIG (requires seperate parts), and MIG welds. This puts it leagues ahead of the Miller and the Hobart that came in number 2 and 3 respectively. While the 322 is perfectly capable of TIG welding you will need to purchase the TIG torch and foot pedal separately. You can find the torch here and foot pedal here. While this does bump the price up close to the Hobart, you're still getting a great deal more capability at basically the same price. Who should buy this machine? The 322 is NOT designed for heavy duty fabrication work. 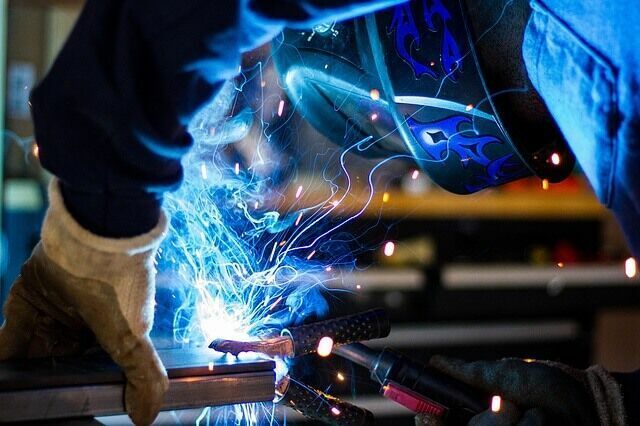 While it can MIG weld up to 1/4" material, this requires a great deal of preparation to ensure you get the penetration necessary for a strong weld. This means no dirt or grease on the material and making sure to hit the work area with a wire brush or grinder. A solid ground connection is also a must. Anything below 1/4" is a breeze. This makes the 322 a great unit for smaller welding projects around the house or on the farm. The​ Forney is extremely easy to use. It uses "euro" style connections that make switching torches quick and painless. The controls are very simple and intuitive. 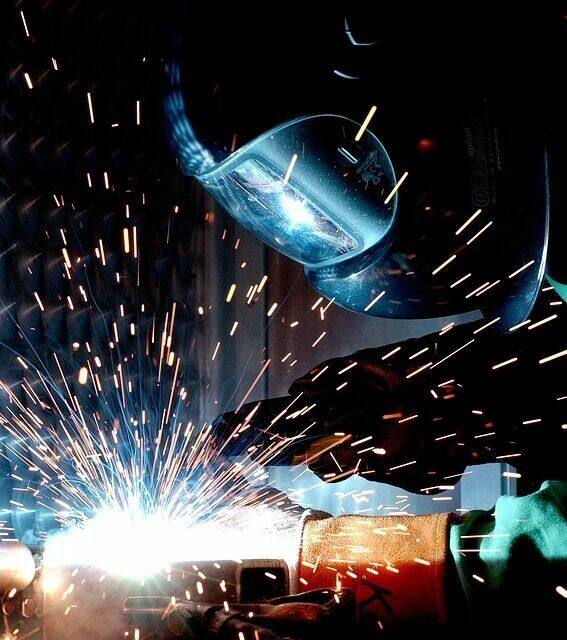 Simply select the type of welding you want to do, make the necessary adjustments, and away you go. The EZ TIG 165i from Hobart is their entry level TIG welder. It offers both AC & DC functionality and operates at 230V. Compared to the Miller this guy is a boat anchor as it comes in at 50lbs. As far as controls go it doesn't get any more simple than the EZ Tig. There is one dial for adjusting your amperage. This is adjustable between 10 and 165 Amps. And there is a single switch for AC or DC operation. The EZ TIG 165i comes with a foot pedal for easy control during operation. It also offers a high frequency start allowing for a non-contact arc start. It also incorporates a couple nice features for extending the longevity of the unit. The first is a fan on demand function that helps to reduce the amount of potential debris that gets pulled into the unit for cooling. The second is an automatic high temperature shutdown feature. The duty cycle on the 165i is 20% at 150A. This jumps up to 100% at just above 50A output. Compared to the Miller, the Hobart doesn't offer the same level of performance, but it's still a solid machine and comes with several accessories that are extra with the Miller (such as the foot pedal). It will work with materials from 22 gauge to 3/16" in both AC (for aluminum) and DC (for steel, stainless, chromoly). With it's simple controls and easy switch between 110V to 220V the EZ TIG 165i is a great welder for beginners. It offers both AC & DC so you can weld steel and aluminum. Sure it is significantly heavier than the Miller, but flexibility is more important that portability when looking at a starter TIG welder. The Hobart is one of the simplest TIG welders out there. It is an excellent machine for those just learning to TIG weld. It offers plenty of power but it is CONSIDERABLY heavier at 50lbs. Still a great machine, just not as portable. Definitely the best TIG welder for the money in this category. The Miller Maxstar 150 is a DC ONLY unit that comes in at a featherweight 13.5 lbs (compared to 50 on the Hobart!). So while it IS highly portable, it lacks the flexibility of working on aluminum. It’s capable of operating at 110v or 220v with an amperage range of 5A to 150A. It works on steel ranging from 0.020 in (0.5 mm) to 3/16 in (4.8 mm). The duty cycle is 30% at 150A but jumps to 100% at 100A meaning this little beast can go all day long. Switching from 15V to 230V is as simple as swapping out a plug. Miller has been making quality welding equipment and plasma cutters for decades. If you’re looking for a TIG machine to form the backbone of your operation you can’t go wrong with the Maxstar 150. In fact, if you need a portable unit, there’s nothing out there better, period. Check out our full review. While it is only DC, the Miller Maxstar is a great unit if you require portability. It's small size means you can take it anywhere. Very user friendly with simple controls. Works with both 120V or 240V using Miller's multi-voltage plug. Saves time when working remotely. Built-in Thermal Overload protection helps extend life by protecting the unit from heat or lack of air. Incorporates a Power Factor Correction system that helps reduce tripping breakers when operating at 120V. At just under 14lbs the Miller is extremely lightweight and portable. The unit includes a shoulder strap for easy transportation. Successful TIG welding is all about accurate amperage control and the Miller is as good as it gets. The fact that it weighs in at 14lbs makes it highly portable, and a 100% duty cycle at 100A means it can go as long as you can. If you're looking for the best portable TIG welder you can't go wrong with this one. For more information check out our full Miller Maxstar 150 review. First place in the 200 amp category (and our top pick overall) goes to the Everlast﻿﻿﻿﻿﻿﻿ PowerTIG 210EXT. Given it's price, this a legitimately powerful machine. It comes in at 60 lbs. It's AC/DC so it can handle steel and aluminum. It will handle up to 5/16" steel on a single pass and 5/8" in multiple passes. On aluminum and 1/4" single pass and 1/2" multi. It also uses a IGBT inverter and features a high frequency start. The 210EXT also offers both 110v and 240v operation so it's got a good bit of flexibility. The price tag is surprisingly low given the amount of power you get with this machine. That said the unit also offers incredibly good performance. Arc stability is fantastic. Heck it even offers 60% cycle duty at 240V and 210A. Pretty much blows away everything in it's price class. If you're looking for a budget machine, you can't go wrong with the Everlast. For use with generators you'll want to insure they're certified as "clean power". This means that the unit has <10% total harmonic distortion (THD). When operating on 120V power, you'll need a generator capable of at least 3500 surge watts. For 240V usage, a generator rated for 7500 surge watts or greater is required. Lincoln has built a solid reputation for quality. The Square Wave TIG 200 welder is a continuation of that tradition. At just 46 lbs it's fairly portable. It's about 10lbs heavier than our 3rd choice the AlphaTIG. It is capable of welding both AC and DC. In addition to TIG capabilities it can also be used for Stick welding applications. It's dual voltage capable so you can use it on either a 120V or 230V outlet. When using a standard 120V outlet it's duty cycle is 25% at 125A for TIG and 20% at 75A for stick. When using 230V the duty cycle is 25% at 200A for TIG and 20% at 170A for Stick. Setup is pretty straightforward using the intuitive push and turn controls on the front of the machine. Our third place vote goes to the Digital Tig 200 from Razorweld. It's right in the middle between the AlpahTIG and the Miller in this category on price. The digital controls on the Razorweld are extremely easy to use. The unit operates on both 115v and 230v and has a duty cycle of 35% at 200A. The high frequency ignition offers pre-gas and an instantaneous Arc ignition just by pressing the switch on the torch. This leaves no tungsten inclusion and leaves the tungsten electrode uncontaminated. It is DC only and capable of producing high quality TIG and ARC welds. It's not the cheapest in this category, but Razorweld is quickly becoming a popular brand among professional welders. This is in part due to it's reliable performance and superior customer support. All Razorweld products are produced in the state of Washington here in the U.S.A.
Fourth place goes to the Dynasty 200 from Miller. There is a SIGNIFICANT price jump between this and the and the other two units in the 200A catgory, but Miller has long been considered one of the absolute best manufacturers out there. This is the type of machine you can build a business around. It's manufactured here in the U.S.A and is backed by Miller's incredible support staff. It offers amazing flexibility with an amperage range from 1A-210A. It can handle steel from 0.002 in. (0.05 mm) - 1/4 in. (6.4 mm) and aluminum from 0.012 in. (0.3 mm) - 1/4 in. (6.4 mm). The duty cycle is 60% at 210A and it can handle single or three phase power. At 47lbs the Dynasty 200 is no lightweight but it offers unparalleled performance and durability. It is a SERIOUS investment, but should serve you for years to come. First place in the 250A category goes to the Everlast PowerTIG 250EX. It offers plenty of power and versatility when it comes to adjusting your welding settings. To take full advantage of all this power you will need a TIG cooler to go along with this unit. On aluminum especially it offers a stable and smooth arc that starts very easily. The 250EX also works with both single and three phase power. It offers both HF and lift start capability and has an impressive 40% duty cycle at 250A. At 200A that jumps to 100%. The pre and post flows offer a wide range of adjustment. All in all it's a very solid machine when you need a great deal of power. Second place goes to the Longevity Innovator 255i. This unit is capable of wearing several hats. It incorporates a pulsed TIG welder, stick welder, and plasma cutter all in one. It allows for easy AC frequency and balance control, pulse control, and up and down slope controls. Pulse welding makes it easier to weld thin gauge metals along with metals that are highly sensitive to heat. It lowers the average temperature allowing you to weld thin material by focusing the arc and allowing the heat to be properly distributed. Pulse welding also limits the arc cone diameter to a precise area giving you better control of the arc. Coming in at number three is the Everlast PowerTIG 255 EXT Digital Ac Dc Tig Stick Pulse Welder. To be fair this is probably the most robust and reliable unit in the 250A group, but it is considerably more expensive than both Everlast models and doesn't offer some of the flexibility of the first two. That being said, if you're going to buy a TIG welder to build a business around, this guy will offer you performance and reliability that is unmatched. It's a single phase AC/DC with an amperage range from 3A all the way up to 310A. It can handle steel from 0.012 in. (0.3 mm) - 1/2 in. (12.7 mm) and aluminum from 0.015 in. (0.4 mm) - 3/8 in. (9.5 mm). It offers a 40% duty cycle at 250A and 60% at 200A. The 250 has AC balance control and several nice memory features to recall your most recent settings, even when switching back and forth between AC and DC. It also has a digital readout for amperage and voltage that shows the presets as well as the actual outputs allowing greater accuracy and repeatability. Miller builds a quality product. And while the 250DX doesn't offer some of the performance (duty cycle etc) it is designed to last forever. If you're looking for a production/commercial TIG welder this guy is built to handle all you can throw at it. In the past few years more and more TIG welders are appearing on the scene from overseas. Some of these are quality products, while others are straight up junk. Here are the most important features, capabilities, and functions you should look for as well as what to avoid. One of the first specifications to look at on any TIG your considering is the amperage range. Ideally you'll want the widest possible range for the best possible price. A narrow range will limit the types of materials with which you'll be able to work. A machine with an amperage range between 5A - 230A will allow you to weld anything from 1/4" aluminum all the way down to 24 gauge steel. Knowing ahead of time the types and thicknesses of metals you'll be working with will allow you to get the most bang for your buck. TIG welding is typically performed on thinner materials. If the starting amperage is too high you risk torching the material or burning clean through. The ability to start the arc without high frequency or hot starts is an especially important feature when working with these thin materials. Stability is just as important during welding as it is during the start. When working with more delicate materials the last thing you want is to burn it right off the bat or have the arc dance around on you. Finally, stability is also important at the finish of a weld. It's common practice in TIG welding to drop the output amperage as your finishing to fill in the weld crater. Stability during this gradual reduction in output is crucial. This is especially true when working with aluminum which can crack if the weld puddle is too thick (concave) or cools too quickly. Getting a machine that is capable of offering both AC and DC output gives you the most flexibility in the types of materials you can weld. To weld hard materials like steel or stainless you'll need DC (direct current). For metals that are self-oxidizing such as magnesium or aluminum you'll need AC (alternating current) capability. As the name suggests, AC alternates between positive and negative. This is serves two different but crucial roles while welding self-oxidizing metals. The positive half cleans away oxidation as it appears. The negative half works it's way into the metal itself. The simplest explanation is this: the negative half of the cycle performs the welding, while the positive half cleans the surface of the weld, exposing the base metal beneath. An absolute must-have for any AC TIG welder is balance control. AC balance control allows you to set the duration of each cycle of the alternating current. This enables you to shorten or lengthen the "cleaning cycle" or the "welding cycle" to suit the metal (more oxidized) and application with which you're working. At a minimum you should look for a machine that offers manual balance control. Some TIG welders will offer automatic balance control that adjusts with the output amperage. If your budget allows for it, this is the ideal. This will help improve both the look and the overall quality of your welds. Another critical feature is to be able to accurately control the heat. When working with thinner or more delicate materials too much heat can warp the metal. Pulse welding is one way of minimizing warpage. When pulse welding the unit will alternate between a lower and higher peak current. This pulse effect allows the arc to remain stable while reducing the heat applied to the material. If your budget will allow, this is a great feature to have. Duty cycle is a measurement of how long a machine can run at a given output in a ten minute window. So a 200A machine with a 40% duty cycle could run for 4 minutes at 200A before needing to be cooled. Less expensive models will have lower duty cycles (20% or lower) as they have smaller power supplies. Higher quality TIGs will have duty cycles upwards of 60%. Price plays a large role in this feature. Bigger power supplies or more efficient units generally cost more. If you're going to need a machine that can reliably run at 60%, don't skimp or cut it close. You'll ultimately be disappointed. TIG welding in general requires a high degree of skill. But that doesn't mean that your machine needs to be complicated. In fact it should be as user friendly as possible with controls that are well laid out and easy to learn. Accessories such as a foot pedal that allows for amperage control is a most definitely a plus. This allows you to increase or decrease the amperage output without looking up from your work. If you're planning on welding aluminum a amperage control foot pedal is a must-have. At the start of the weld the metal can be quite cool and require more power. By the time you reach the end of the weld the aluminum will have heated and your amperage will need to be lowered. Hand controls are fine, but imagine trying to drive your car without the use of your foot accelerator. It would unnecissarily complicate things. If you're serious about welding, invest in a unit that comes with a foot pedal, or buy one separately. Improper input voltage: Make sure you understand what your power capabilities are. Some welders operate on both 110v and 220v. The power output at 110v will be significantly less than at 220v. Some machines also operate on single or 3 phase power. Make sure to check the input voltage of the unit you want to ensure it matches up with what's available where you'll be using the unit. Unnecessary functions: If you're not going to be welding aluminum or magnesium, you don't need a unit with AC capabilities. This can add significantly to the cost. Cooling Units: Larger welders like the Everlast 256S will require separate cooling equipment to get the full power out of the machine. This adds significantly to the cost. Make sure you know if the unit you pick needs a cooling unit to maximize it's duty cycle and output. Understand Power Demands: If you think you might require more power from your unit at some point in the future make sure to build this into your decision. Spending a little bit more now is better than having to invest in a bigger machine down the road. Overkill: While there are worse problems than buying more machine than you need, it's easy to get carried away when buying heavy equipment. If you're a hobbyist, going with a unit with plenty of power and a lower duty cycle can help you save some money. 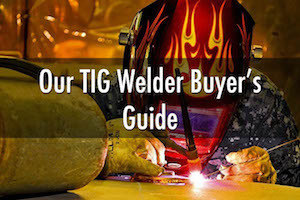 Finding the best TIG welder for your needs should be a balance of features and price. We hope you have found our reviews helpful.